I don’t recall having red beets until I was in my early 20’s even though I’ve lived in Canada all my life. Even after sucking up delicious red borscht soup at a Hungarian restaurant several times in Toronto, I never prepared any red beets at home. Until less than 4 years ago. You won’t find red beet recipes in most traditional Chinese regional cookbooks. Maybe you might be lucky in northern Chinese cuisine cookbook or a Muslim Chinese cookbook. Let me know. dead simple and even more delicious when oven hot beets, are served with crumbled feta or goat cheese. Be even lazy diverse, by roasting beets along side with large pepper slices and tomato chunks. Then only 3 years ago, we both realized one could cook beet greens. Being a lazy cook, I used my fastest and oft used method : stir-frying. With less than 1 tsp. 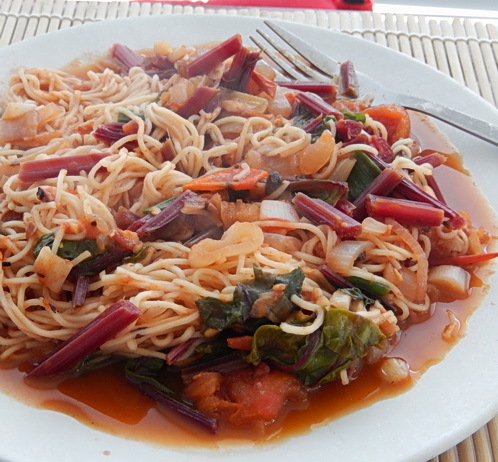 of Chinese chili garlic black bean sauce (or hoisin sauce), onions, garlic, ginger root, beet greens can be stir fried with tomatoes. About 8 minutes before completion, fold in cooked, drained noodles. Candy cane beet variety cut open. It’s taken me over 50 years of my life to land upon this dead easy recipe that I invented in an evening. My twist on red nutritious glory of beet would be: toss in minced lemongrass at the beginning with frying onion, garlic and ginger root. Or top off the hot beet greens dish with fresh cilantro when serving at the table. A palate perk for an easy autumn dish. I love borscht! 20+ years ago I grew beets in my garden and pickled them in the fall. Beets also make a wonderful substitute for potatoes as oven french fries! Beets as oven beet chips sounds yummy..and invigorating. I always find eating red beets seems add a bit of energy for me. I’m sure you can making borscht in your sleep by now. Actually, I’ve never made borscht! I should learn! Wow, your recipes look delicious! I’ve never tried red beets, but I do love the purplish ones. Are they the same? I’ll have to look for them at our market! Lovely post. We use the purple-red ones –on far left of my lst photo. The root and greens. I’ve never tried cooking the greens for the golden beets (orangish ones). 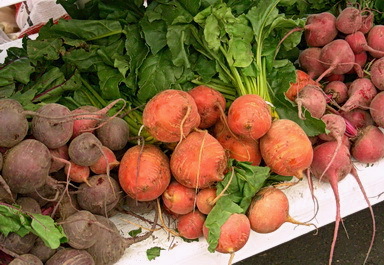 The golden beets don’t taste as deep and rich as the purple ones. I love beets. I love borscht–though I haven’t made it for years. However, your beet recipe sounds and looks incredible. And I think I can buy great beets here! Thanks for sharing your creation. Should I actually write a recipe for this? I’m such a lazy bird because it means testing right amounts of ingredients. By the way–great title for this post!!!! Hi Jessica: This easy dish would be show-stopper with its colours for friends and family. Yum, this looks delicious Jean. Just my type of recipe, easy and yummy! Yup, very fast. After cutting up the ingredients…it’s done under 10 min. after stir-frying. Must be served hot. 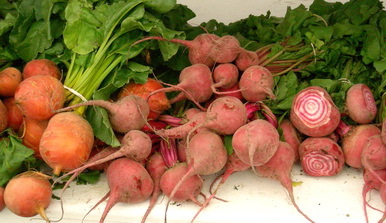 Yum – I love red beets in all manifestations! When I lived in the U.S., I used to cook a beet soup, with garlic, onions, celery and tomatos. It was a real easy and healthful soup to make. You are right, beets are rare in China, at least in Shanghai. Thanks for sharing this yummy recipe. I’ll have to try it one day! hope you’ll check it out one day. I love beets and my favorites lately have been the golden ones. My friend sliced them up and did them like french fries and I was hooked! Golden beet french fries sounds like a delicious twist and yes, it’s hard not to enjoy borscht. One year we tried red beet ravioli with won ton wrappers. It tasted fine. A fine sauce might have kicked up that taste. [ Smiles ] Being vegan, I eat lots of beet. And, even before I became a vegan, I consumed lots of beet.